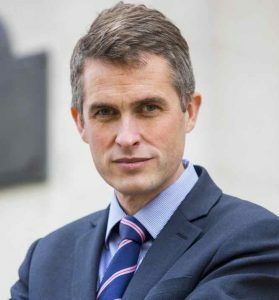 On Wednesday, February 21st, the UK’s Minister of Defence, Conservative Gavin Williamson, announced that the United Kingdom is changing its fundamental defence strategy from one that’s targeted against non-state terrorists (Al Qaeda, etc.) to one that’s targeted instead against three countries: Russia, China, and North Korea. He acknowledged that a massive increase in military spending will be needed for this, and that “savings” will have to be found in other areas of government spending, such as the health services, and in military spending against terrorism. Asked whether Mr Williamson accepted that this would have a knock-on effect for how Britain’s military was structured and its readiness for war, “Yes it does,” Mr Williamson replied. 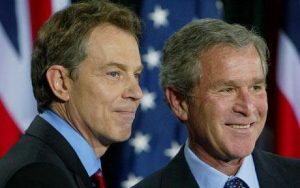 Just as happened when UK’s Prime Minister Tony Blair made his country the U.S. President George W. Bush’s lap-dog in the invasion of Iraq in 2003, UK’s Prime Minister Theresa May is making her country U.S. President Donald Trump’s lap-dog now in the invasions to come, of North Korea, Russia, and China. The situation is likely to be even more difficult in UK where, according to Gallup’s polling in 2017, as reported in their “Rating World Leaders: 2018”, residents in UK who were asked “Do you approve or disapprove of the job performance of the leadership of the United States?” answered 63% “Disapprove,” and 33% “Approve,” and the net approval (-30%) had declined 26% from the prior President Obama’s rating (-4%), in 2016. Consequently, in order for the leaders to do this, there will need to be a total divorce from even the claim of being ‘democracies’ because, on such a momentous decision as to whether or not there should be a Third World War (and if so, whether Iran should be a target in it), going against the overwhelming public opinion wouldn’t be possible except in what is effectively a dictatorship (such as the U.S. has been scientifically proven to be). So: actually achieving this will be a stretch, but at least in the United States — a proven dictatorship — it’s possible. Whereas the press both in the U.S. and UK willingly pumped up the lies of the Government, that according to the IAEA Saddam Hussein was only six months away from having nuclear weapons, they might not do it this time against actual nuclear armed nations because there probably aren’t yet, and won’t soon be, enough billionaires’ bunkers deep underground — such as here, and here, and here, and here, and here, and here, and here, and here, and here, and here, and here — to protect them from even the nuclear blasts, much less anything at all to protect anyone at all from the resulting nuclear winter and global famine. So, perhaps greed will finally meet its limit: sheer self-preservation. It’s one thing when a foreign country, such as Iraq — or Libya, or Syria, or Yemen — is destroyed, but quite another matter when the world itself will be. The degree of insanity that the military-industrial complex is now assuming to exist amongst the general public might simply not be there, at all. Finally, Western governments’ weapons-manufacturing firms might need to face the steep declines in their stock values that all of them so richly deserve, and that’s been held off already for decades too long — since at least 1991, when the Soviet Union with its communism and Warsaw Pact military alliance all ended, and all that’s left available as bogeymen who must be killed in order to ‘save the world’ is: Russia, China, North Korea — and maybe (if the Sauds and Israel are to have their way), Iran. It’s not yet clear just when — if ever — the ‘democratic’ countries in The West (the U.S. and its allies, the billionaires there) will reach the limit of their imperial greed. But if the world is their limit, then there is no limit at all, because the world itself will end before this limit is reached. And, now, it’s not only Donald Trump who is leading the way there, but Theresa May has joined his luxurious march to global oblivion. So Who Illegally Annexed the Crimean Peninsula Then?